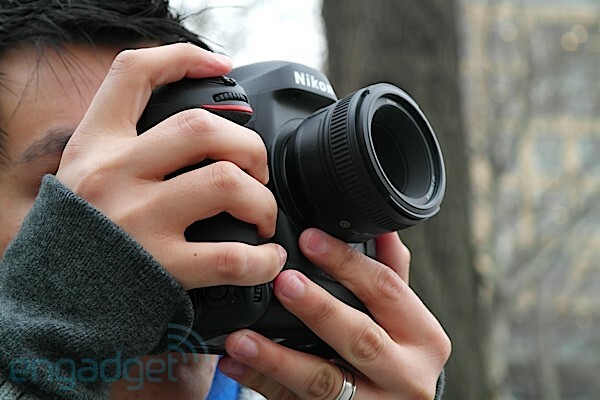 Remember when we were in a tizzy about the Nikon D4, way back in January? We got to play with this tank of a DSLR a bit, but sadly weren’t permitted to actually publish any of the photos or video that we shot with the thing. Sure, we’ve seen some samplesof it in action, but it’s not quite the same. Thankfully, the company made our late-February that much better, allowing us to take the D4 on a jaunt around the city, a couple of weeks ahead of its mid-March launch. We strolled around Washington Square Park and 6th avenue, with the beast of a camera in-hand, shooting tourists and scenery, before popping by a subway station to have a go with the camera’s purported excellent low-light capabilities that we’ve been hearing so much about. Click on through to take a look at some sample video. The first thing you’ll notice when you pick up the D4 is just how massive it is — the camera’s $6,000 pro body is big and a bit heavy, but it’s only fitting, seeing as how Nikon managed to fit just about everything onto the camera, like the a proprietary port for a TW-5A plug-in WiFi adapter, an Ethernet jack, remote connector, headphone jack, mic in, mini-USB and HDMI port that does uncompressed live preview feeds all on the left side. Despite its giant size, the D4 was extremely easy to hold, though you might want to exercise your upper body a bit, if you plan on using it for an extended period. The full-time autofocus is extremely fast on the camera, but it’s quite loud (see the top video) — the clicking sound picked up audibly as we were shooting video, so if you’re also capturing sound, you’ll want to set it to manual (directly above). Dialing it down to medium helps a bit, but the clicking is still present. Unfortunately, our shooting was hampered a bit by the 50mm f1.8 lens on our demo unit (which was dwarfed by the massive camera body) — thankfully, we’ll be getting some extended time with the camera soon enough and will be able to couple it with some lenses that will do it justice. Shooting in the relative low light of the subway station, things got a bit blurry (again, we’re blaming the lens here), though there was no noise on the image. The colors really popped with the D4, as well. We stopped by a flower shop and took some shots outside — colors don’t get much more bright and vivid than that.All in all, we liked what we saw with the D3′s successor, though we wish we got a bit more time with it. As soon as we do, you’ll be hearing more about it. Filed under Blog and tagged with First look, Gear, Nikon D4. RSS 2.0 feed. Tortuga Travel Photography Adventure Workshops formed in the summer of 2009 with a common goal of sharing our knowledge of great still photography and love for the amazing diversity and similarities of cultures and people around the world.